A special tradition remains in one coastal town in Belgium. It combines the power of horses and the will of men, to bring us a tiny, sweet gift from the sea – the Belgian Grey Shrimp. Andrew and I joined the small group of tourists and locals gathered along the boardwalk of the small Belgian coastal town of Oostduinkerke. We were all there to see a sight once common along the Belgian and Northern French coast, which has now all but died out; except for here. 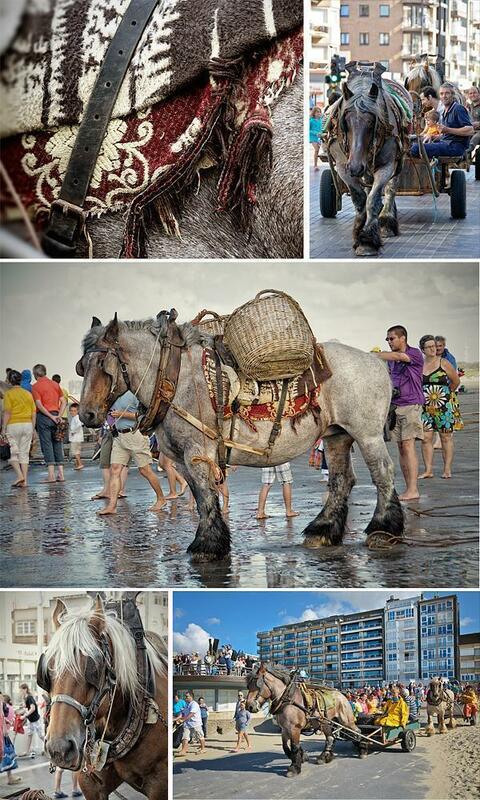 We were waiting for the arrival of the Oostduinkerke Shrimp Fishermen, or paardenvissers, and their horses. 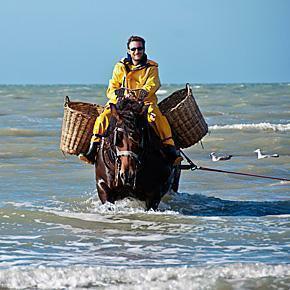 You may be wondering what horses have to do with shrimp fishing. The reason is exactly why our group was waiting on the beach. 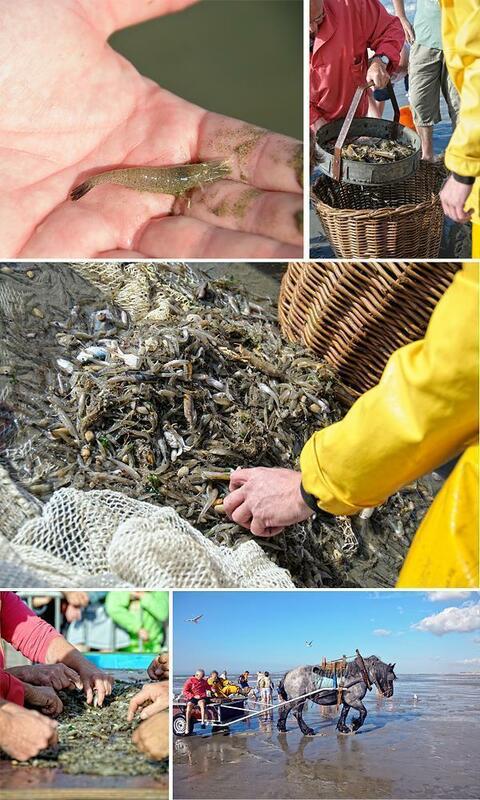 This unique tradition pairs man and beast against the sea (and the shrimp) and we were excited to see it happen. Finally we could hear the clopping of heavy hooves on pavement and the huge Brabant and Hainaut stallions appeared, pulling carts filled with nets and gear. They paused at the boardwalk for the fishermen to don their bright yellow slickers and Sowesters and then paraded down to the sea’s edge, trailing our band of spectators. We were fortunate with the weather. It was a blue sky day, with white puffy clouds and water warm enough to wade into. But the shrimp fisherman of old worked year round, rain or shine, an hour before and after low tide. 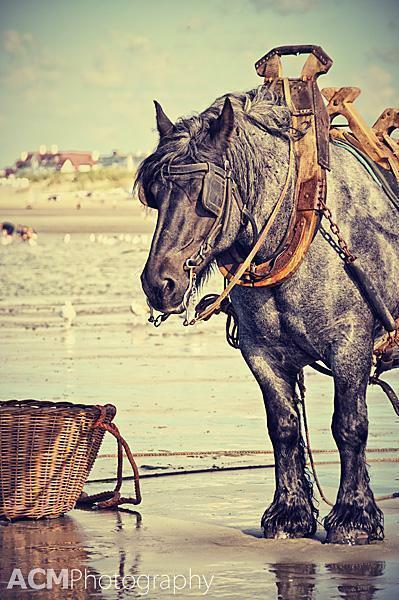 We milled about as the fishermen secured their nets behind their horses and, one by one, they climbed into their rough wooden saddles and slowly waded into the sea. The horses were chest high in the water pacing back and forth, parallel to the shore. 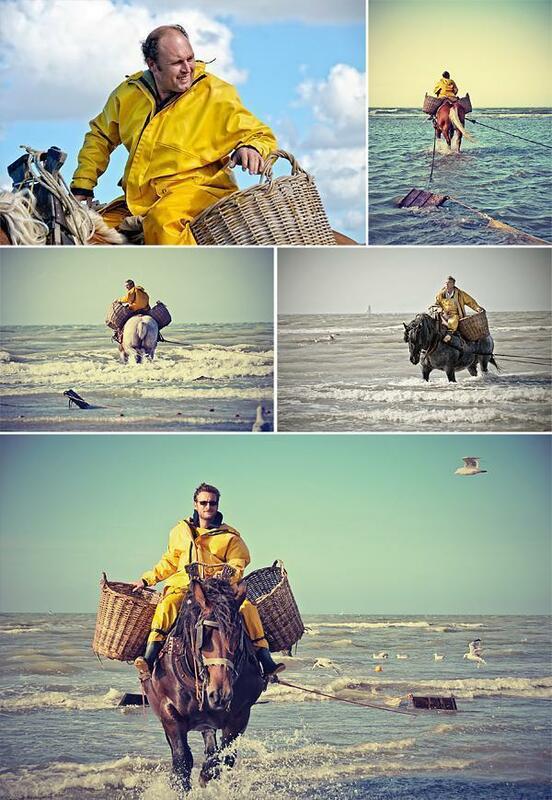 Into the sea – The shrimp fishermen and their horses get to work. When their nets felt heavy enough, they headed back to the beach to empty their nets. Spectators gathered around as the fishermen sorted the shrimp from the other marine life also scooped into the nets. Small crabs and fish were tossed back to swim the gauntlet of hungry seagulls, who arrived to freeload their lunch. The process was repeated and after two hours the show was over. The horses trudged back up the beach, hauling their carts. But now was the moment everyone was waiting for. The crowd suddenly swelled, like a flock of hungry seagulls, around a fenced off area on the boardwalk. Inside, the fishermen and their families deftly sorted the shrimps further; their fingers flying through piles of grey crustaceans, picking and flicking. 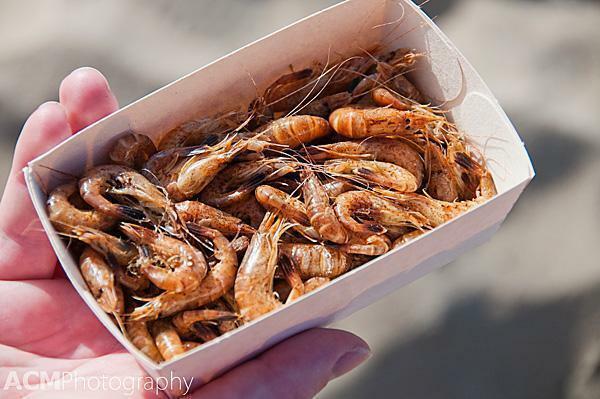 In no time, the shrimps were cooked and the group of hungry spectators thrust Euros in the air, trying to get their hands on one of the small boxes of now bright pink cooked shrimps. Andrew’s perseverance paid off and we scurried off to find a spot on the beach to taste our booty. We pealed and crunched the slightly sandy shrimps and savoured their sweet saltiness. Beach food has never been so good. While fascinating to watch, the plight of the shrimp fishermen and their horses is bittersweet. Only a dozen or so remain who are still practicing this 500 year old tradition. It has become a tourist attraction rather than a livelihood. Still though, there is pride on the faces of these men and genuine admiration in the crowd who comes to witness this spectacle. See it now while you still can. 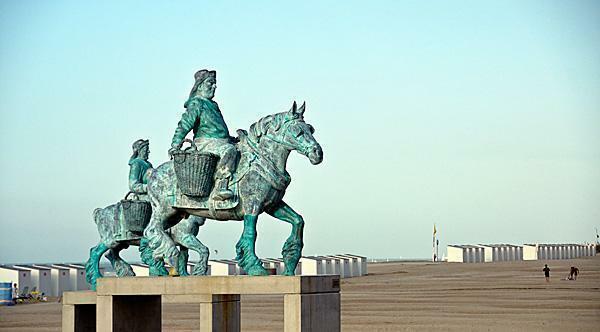 For more information on the Oostduinkerke Shrimp Fishermen on Horseback and the schedule of fishing times, visit the Koksijde tourism website.